Experience the real life of a Fox in Amazing Jungle Environment!! What is Wild Fox Adventures All About?? Wild Fox Adventures 2016 is a game where you will experience the real life a jungle Fox. This games is another induction in gaming of real wild animal life simulation. Wild Fox adventures 2016 is a combined Fusion of Adventures, Simulation and rampage around the Jungle. Move into the terrifying realm of Wild Fox and Experience the Realistic jungle Hunt! You are an angry and vicious Fox leading a family of little cubs looking to slaughter anyone who comes within your sight. Search for food and fight for survival against brutal Humans and animals. The Jungle is filled with human’s sheep, buffalo’s, lions, tiger, panthers, t-Rex & lot more animals. Target your prey, Increase your Speed and attack viciously! Get hold of your best hunting Skills! Kill and eat your prey to enhance your life & Hunting power! Experience the real fox life. Mark your territory, hunt animals, Eat, Drink, Sleep, Mate and lot more features. Multiple types of attacks including Bite, Hook and Pounce attack, Automated Power Attacks for prompt kills. Taste the exciting adventures of Wild Fox in this most dangerous terrain!! • Amazing Eat, Drink, Sleep, Mate and lot more features. • Exciting Prey Hunting experience optimized for mobile devices. Install & Play now!! 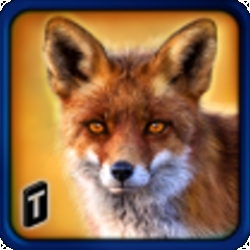 Experience Life-like events of Wild Fox life! !